“I take the time to evaluate, and where necessary adjust where I am with regard to the goals I have set for myself. In doing so, and in taking action on the items I’ve identified as most important I am guaranteed to see progress and move confidently in the direction of what I have determined to be most worthy of attainment. * Josh Hinds is available for keynotes, breakouts and personal development trainings. 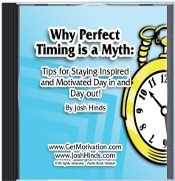 Visit http://www.JoshHinds.com for speaker information.